Vanilla caught my interest because of it being written in verse, something you don't come across often within YA fiction. I am a big admirer of what Sarah Crossan has done with One and Moonrise, which are both told in verse, and I was curious to see how this way of storytelling would work with another author's voice. And I can say that it was incredible. Though using less words than an average novel, this approach conveys so much more meaning and emotion and it really allows the reader to understand the characters on a much deeper level. The story of Vanilla was a beautiful one as well as it was an eyeopening and thought-provoking exploration of gender identity and sexuality. Diversity as a theme might be 'hot' in the YA community right now but don't let that make you think this is a book just jumping on that bandwagon. It was honest, raw and evocative, and a worthy addition to any YA reader's collection. Read my full review here. 5 stars. Get your copy here. I know Jen Campbell as a vlogger who shares her love for short stories and poetry in a very engaging way. Even though they're not normally the types of reads I'd pick up, her enthusiasm really shines through in her videos. So when I heard that she was releasing her own short story collection I was intrigued. This debut is filled with weird and whimsical fairy tales in contemporary setting, which makes the darker aspects we often take for granted in old-fashioned fairy tales even more disturbing than they already are. I won't pretend that beyond the references to the most well-known tales I understood all of the links or even the meaning of most of the stories within this collection, but I did fall in love with Jen Campbell's imaginative writing. And, for once, I feel that the short story format worked extremely well here, rather than merely teasing a larger story left untold. 4 stars. Get your copy here. In Sempera power comes from time; the poor have their time drained from them through their blood and the rich consume the blood irons with their cup of tea to live for hundreds of years. This highly original fantasy concept is made even more fascinating by the tale of the Alchemist and Sorcerer; two magical beings that supposedly started with the power play of controlling time. Whether fictional or based on true events, the young Jules lives on the wrong side of the power struggle as a poor servant in the household of the rich Gerlings. She lived on the estate as a child and after being forced to leave she never forgot about the boys she grew up with, kind Roan Gerling and his wicked brother Liam. When she returns it doesn't take long for her to reconnect with Roan. Except Roan is engaged to be married to Ina Gold, the girl who will inherit the throne when the Queen steps down... Everless was so interesting and different that it constantly took me by surprise. I didn't see some of the biggest revelations coming, especially in regards to Roan and Liam and I really enjoyed that level of suspense that came with it. I did not like that it ended on a massive cliffhanger, but when a story is *this* gripping I'll give it the benefit of the doubt. 4.5 stars. Pre-order your copy here (it's published on 4 Janaury 2018). I've been addicted to Sara Shepard's novels ever since reading the first Pretty Little Liars books years and years ago, and I do believe her Amateurs series about a group of young sleuths who met on a cold case forum is one of her best ones yet. After the shock cliffhanger at the end of the first book, we dive straight back into the action. A message from Brett arrives, and the gang gets back together to find him once and for all. However, in their search they stumble into a new case: the kidnapping of social media starlet Chelsea Dawson. Chelsea looks just like Aerin's murdered sister Helena, fitting Brett's type perfectly, so Seneca, Aerin, Maddox and Madison know they don't have long if they want to find her alive. But with Brett a master of disguise, and no photographic evidence of their last encounter, he proves more elusive than imagined; always one step behind. Follow Me is a thrilling mystery, keeping the reader as much on their toes as it does the characters. It's well-plotted, twisty and with a killer ending. 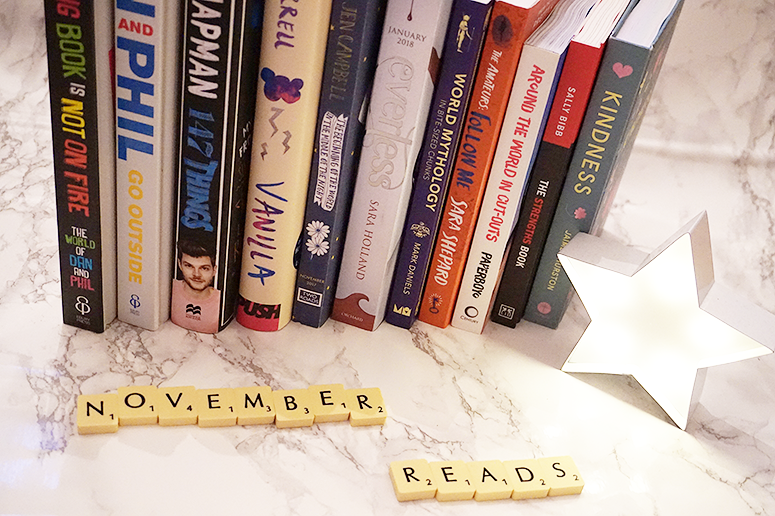 I'm already desperate to read the next instalment! 4 stars. Get your copy here. I've become pretty obsessed with watching YouTube videos in the past year, they're a great form of escapism and their short-form content make them ideal for a quick watch before leaving the house in the morning or 'just one more video' after coming home late at night (though, we all know it's never just one more video...). Two YouTubers I've discovered are Dan and Phil; self-proclaimed nerds who on their channels share awkward and embarrassing stories, funny sketches and gaming let's plays. Their banter is hilarious and provides the perfect antidote to stressed out work days and general life blerghness, and their Amazing Book is Not on Fire truly translates their humour and wit onto the written page. Along the way you'll get insights into their lives before YouTube, the start of their channels and their friendship, travels, the gaming channel, and written versions of some of their most well-known video series, from Weird Kid to the Seven Second Challenge. A great book not only for anyone who's already an avid viewer of their videos, but also for those who can appreciate good banter and are looking for a funny book to make them smile. 5 stars. Get your copy here. 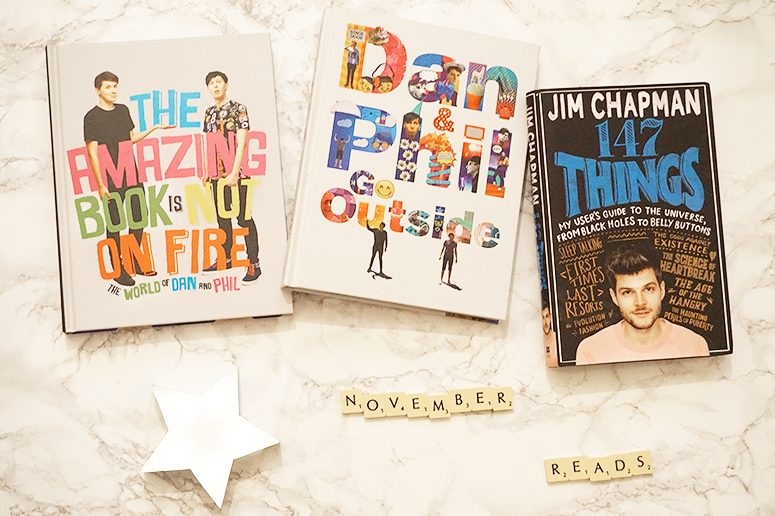 After just reading The Amazing Book is Not on Fire (TABINOF), I of course had to also dive into their other book Dan and Phil Go Outside (aka DAPGO). Filled with more bants, rants and insights into the lives of YouTubers Dan Howell and Phil Lester, this photo-heavy hardback chronicles their lives on the road when they were performing The Amazing Tour is Not on Fire across Europe and the US. I would say that this is one much more geared towards existing fans of the duo as there are less stories than in TABINOF that would be able to engage the average reader looking for a funny book, and more photos of Dan and Phil and their show. There are still some pretty hilarious commentaries along the way though (not to mention tons of embarrassing moments) that capture the duo's iconic banterific humour and will make you smile from start to finish. 5 stars. Get your copy here. 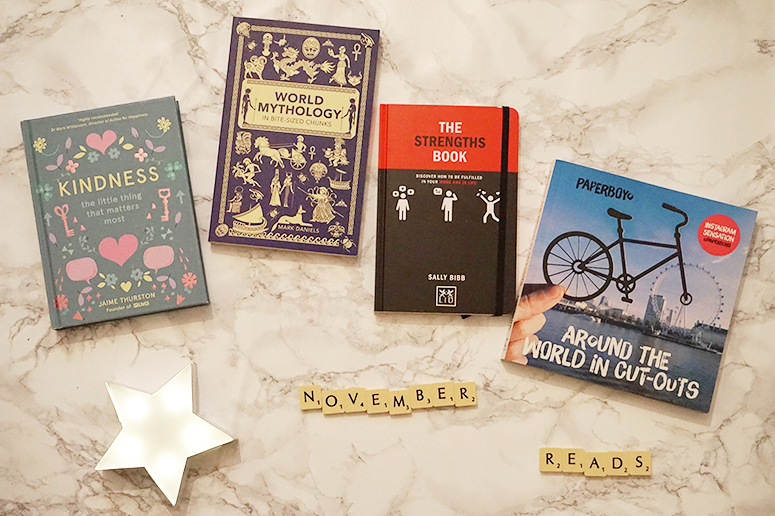 This book jam-packed with weird and fascinating facts is very suitable for the colder season because when else will you have all the time in the world to properly hibernate with a read for hours on end and soak up knowledge from the start of the universe to strange phobias? YouTuber Jim Chapman has broken the content-creator mould with this very different and really wonderful non-fiction read that not only provides heaps of interesting tidbits but funny stories from his own life too; making it a relateable read both for existing fans and people who are not yet familiar with him. Besides, with facts and stories on zombies, why Jurassic Park is all lies, life (and death) and belly buttons – there is something new and interesting to discover within the pages of this book for anyone, regardless of what you're into! 4 stars. Get your copy here. 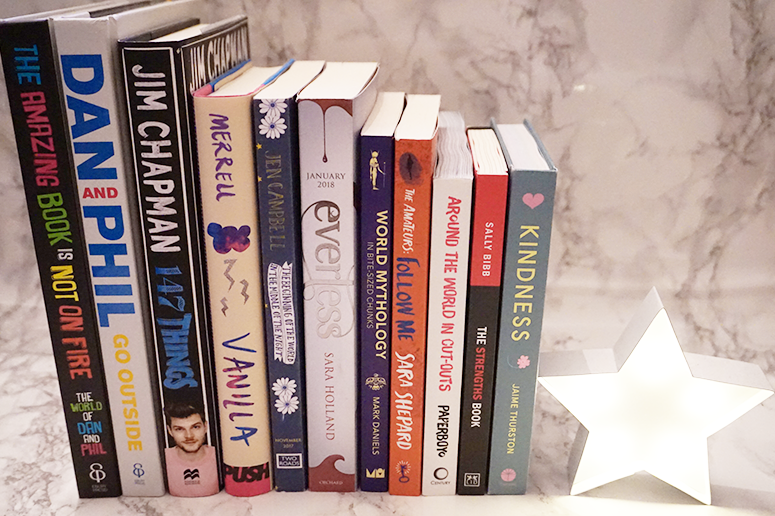 After The Little Book of Hygge and The Little Book of Lykke I've become a little addicted to beautifully designed, compact hardcover books filled with inspiring words or a happier life and better world. Kindness perfectly fits into this category, as it contains 52 ideas to spread kindness to others in some very simple ways. From truly listening (rather than interrupting) and apologising (and really meaning it) to setting up an online wish list for a person in need, or sharing encouraging words to someone who is having a hard time. These 52 ideas are intertwined with real-life examples of similar projects or things that have made a difference, from strangers sending encouraging video messages to a young boy who was being bullied to donating shoes to schools. The key for all of these projects is that is doesn't have to be time intensive or expensive to help someone else, but just a minute each day or a more conscious approach to a situation can already be the first ripple in creating a kinder world. 4 stars. Get your copy here. I love legends and mythologies and after recently devouring Norse Mythologies by Neil Gaiman I'd been keen to discover more stories from cultures and countries outside of the well-known Greek and Roman tales. This book provides a bite-sized insight into stories from Aboriginals, Aztecs and more and there are certainly some very fascinating characters and myths touched upon, but that's all they were: touched upon. It felt like reading the first paragraph of Wikipedia articles on the stories in a non-logical order, providing a dense information dump that ultimately didn't stick in my head as there were just so many names and places jumbled together. I think it'd be better to read dedicated books on each as the tiny fragments covered within this book just didn't quite work. 2.5 stars. Get your copy here. This book's cover promises that the reader will discover how to be fulfilled in in work and life, something I feel I've been struggling with for some time now. Not only that but it focuses on strengths rather than weaknesses, positives rather than negatives, which in a high-pressured society where people are often forced to change who they are to conform to what a company believes is most important is a refreshing perspective and one I certainly am 100% behind. There were some profound insights within the book to help accomplish that fulfillment and strengthen your strengths, but the few genuinely revelations were repeated too many times and the reality is that even if you focus on your strengths and grow as a person, unless the people and colleagues around you also change there will still be the expectation of eradicating weaknesses and not patting yourself on the back for your strengths. So unless everyone reads this book and takes the message on board, it'll be very difficult to help drive through real change. 2.5 stars. Get your copy here. Paperboyo in an Instagrammer who uses paper cut-outs to elevate his pictures from famous things and places around the world; it's clever and a really fun way to create unique images of buildings and locations we may have seen a million times before but never quite like this. The book version not only combines all of his best photos into one compact and transportable item, but he also adds insights to each of the pictures, from his inspiration for the paper cut-out choices to fun facts about some of the buildings and places photographed. Unfortunately I found this element of the book didn't work quite as well because there wasn't any consistency; sometimes it was a history lesson, sometimes a personal anecdote and sometimes the text was completely unrelated to the photo. His unique pictures work better on Instagram, but the book is a fun novelty gift for any fans of photographers, crafts, architecture or travellers you may know. 3 stars. Get your copy here. Have you read any of the above books? 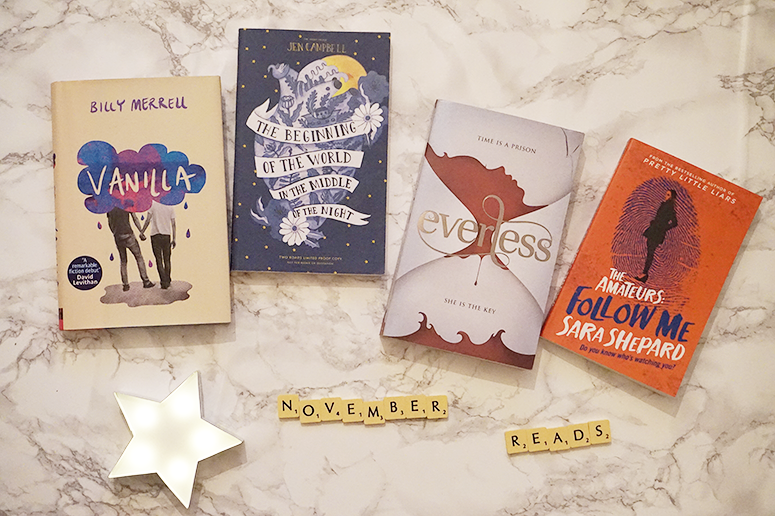 And what have you read in November? Let me know in the comments below!